Bella Jane Boat Trips welcomes you aboard AquaXplore - our offshore RIBS (Rigid Hull Inflatable Boats) and Island Cruiser. 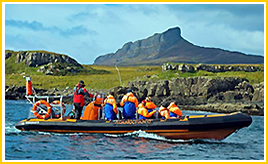 Join us to experience the remote and beautiful isles of Canna, Rum, Soay, Eigg and the Cuillin and Loch Coruisk. Breathtaking scenery, unique history and abundant wildlife - with regular sightings of Minke whales, Basking Sharks, Dolphins, Porpoises, Sea-Eagles, Puffins and majestic seabirds in this rich marine environment. A 35 mile trip - the longest 3.5-4hr trip anywhere. See more, get closer! – Puffins, Wildlife, Scenery, Caves. Best for comfort – cushioned individual seats. Stay warm and dry with our custom made oversuits. Unique NO HYPE Money back Guarantee. Four star Tourist board award for Excellence. NOT TO MENTION....Twelve years of Experience, with Thousands of customers and Hundreds of trips every year AND Economical and wildlife-friendly boats - The Best Experience and Value all round! The trips below are available on AquaXplore or Island Cruiser as stated. If you have a preference please state this in the comments field when booking. If you do not state a preference we will assign you to whichever type of boat is available. For walkers / climbers or those just wanting to make the most of their day -. take an early trip into the mountains and Loch Coruisk. Return passengers can choose from a later AquaXplore or Bella Jane return sailing - normal Bella Jane fares then apply. For visitors with less time - an exhilarating, fun trip for wildlife and sightseeing. See Bonnie Prince Charlie's Cave, the Isle of Soay, the Cuillin mountains and the seals. Visit Prince Charles' Cave, then on to the Isle of Soay looking out for basking sharks, dolphins, sea-eagles and porpoises as we travel along. Pause to view Gavin Maxwell's old Basking Shark Station (tidal restrictions sometimes apply) before sailing on into the heart of the dramatic Cuillin mountains. Visit the resident colony of harbour (or common) seals hauled out on the rocks in this stunning setting. Then see Camasunary and Glen Scaladale on the return trip to Elgol. Best for comfort – cushioned individual seats. Stay warm and dry with our custom made oversuits (on AX). Experienced and knowledgeable skipper-guides. Unique NO HYPE Money back Guarantee. Four star Tourist board award for Excellence. See the beautiful Isle of Eigg, with the dramatic An Sgurr ridge, Massacre cave and Laig bay, together with the eastern side of the Isle of Rum. Look out for a wealth of marine wildlife such as whales, dolphins, porpoise and many seabirds. Time ashore on Eigg. Sail to Eigg - a beautiful island with a rich and fascinating history. 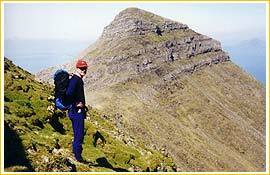 See the dramatic An Sgurr ridge, Massacre Cave, Laig Bay and the Singing Sands. 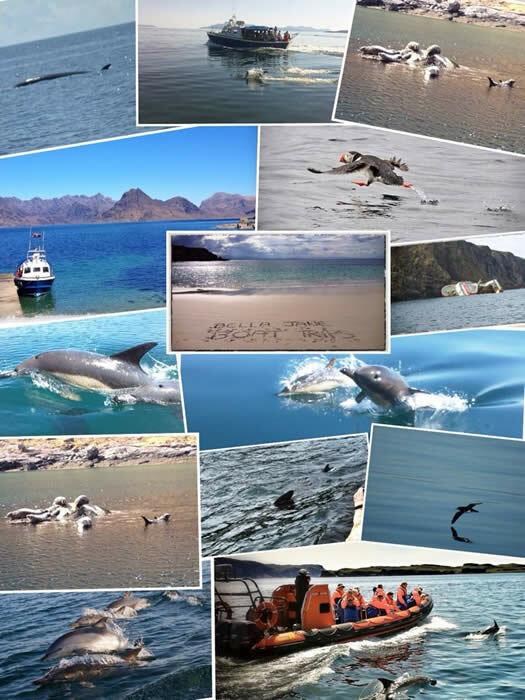 Watch for basking sharks, dolphins, sea-eagles, porpoises, whales and a rich variety of seabirds as you travel along. Go ashore at Galmisdale in the south east of the island to explore, or visit the tea room and visitor centre. On return to the boat we continue around the island and call by Loch Scresort on Rum on our return to Elgol. Our most popular trip with a great record for wildlife sightings! See the beautiful Isles of Canna, Rum and Soay with Sea Eagles and Red Deer on Rum and many seabirds on Canna including the Puffins (April to July). 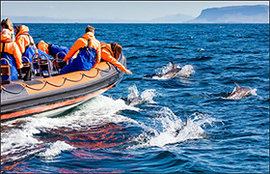 The best trip for regular sightings of Dolphins, Minke Whales, Basking Sharks. Time ashore on Canna. Depart from Elgol jetty and head west through Soay Sound pausing to view the Basking Shark Station (tidal restrictions sometimes apply) before making the half hour crossing to Canna, the most westerly of the Small Isles. Cruise around the base of the dramatic sea stacks and cliffs, home to Fulmars, Guillemots, Kittiwakes, Razorbills and between April and July, thousands of Atlantic Puffins. Harbour porpoise, Dolphin, Minke Whales and Basking Shark are regularly sighted in the Summer months. You will then have approx. 1 hr ashore allowing time to stretch your legs or visit the Canna Tea Room. Toilet facilities are available. We will then spend a few moments with the Atlantic Grey Seals before heading back for Elgol along the north coast of the Isle of Rum, pausing en route at Kilmory bay where the Red Deer are usually seen. The all-day version of our popular “Puffin Run” / Canna trip. You will see all the same places and wildlife as on Trip 4 but will have approx. 5 hrs ashore to walk and explore on the Isle of Canna. Making it possible to spend approx. 5 hrs ashore to explore these unique islands. You can take coastal walks, visit stone crosses, sheilings and churches or picnic on white sandy beaches. Look out for basking sharks, dolphins, sea-eagles, porpoises and a variety of seabirds - including Atlantic Puffins from April to July. Toilet facilities are available at the harbour. # See our Questions page for more information. Journey to the beautiful Isle of Rum and explore ashore for 2 ½ hrs approx, giving the opportunity for walks around the Kinloch area and taking the Kinloch castle tour (castle tour – p.m. trips only). 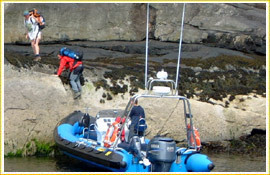 Depart from Elgol jetty and make the short half hour crossing to Rum National Nature Reserve, once called the 'Forbidden Isle'. Look out for Minke Whale, Dolphin and Porpoise on the way - we regularly pause to watch them. You will be landed ashore at Loch Scresort jetty, just a short walk from the extravagant sandstone mansion - Kinloch Castle - Britain's finest example of an Edwardian country house, the second place in Scotland to have its own electricity supply. An exotically furnished and centrally heated castle makes it an ideal destination even on a wet day - The guided tour of the castle takes 1 hr approx. You can also choose from a variety of nature and heritage trails around Kinloch - site of Scotland's earliest known settlement, or relax on the shore of the Loch and look out for some of Rum's shyer inhabitants, such as Otters, Red Throated Divers and the magnificent White Tailed Sea Eagle. 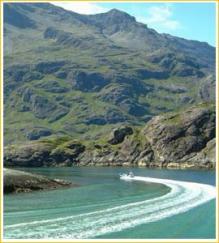 Journey to the beautiful Isle of Rum and have a full day to explore (ashore for 6 hrs approx.) giving the opportunity for walks around the Kinloch area or further afield to Kilmorie bay for example. You also have the option of taking the Kinloch castle tour. Making it possible to spend approx 6 hrs ashore. 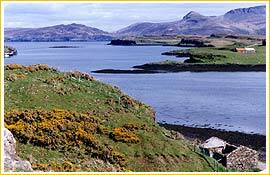 Rum is more rugged than Canna; there are nature and heritage trails around Kinloch for gentle strolls. Good walkers should manage to walk to the summit of Hallival (723m); its slopes are covered in Manx Shearwater burrows (site of the largest colony in the UK), with around 60,000 breeding pairs. Climbers/scramblers should have time to carry on to the summit of Askival - the highest peak on Rum (812m) for fantastic views. Low level longer walks include Harris Bay (site of the Bulloughs Mausoleum) or Kilmorie with its white sandy beaches and the remains of 19th century settlement in the dunes still clearly visible. Minimum of 6 normally applies - See our Questions page for more information. The ultimate trip - taking you to the Cuillin mountains, the seals and Loch Coruisk, then on to the Isles of Soay, Canna and Rum. A packed exciting day of stunning scenery, wildlife and history. Like Trip 4, this is a great trip for regular wildlife sightings of Dolphins, Minke Whales, Basking Sharks and the seabirds on Canna, including the Puffins, between April and July. Set off from Elgol into the heart of the Cuillin, then visit the resident Seal colony before going ashore for approximately ¾ hr at Loch Coruisk. Walk and explore in this stunning landscape before rejoining the boat. Then we sail on to Soay, pausing to view Gavin Maxwell's Basking Shark Station (tidal restrictions sometimes apply) before making the half hour crossing to Canna, the most westerly and scenic of the Small Isles. Cruise around the base of the dramatic sea stacks and cliffs, home to Sea-Eagles, Fulmars, Guillemots, Kittiwakes, Razorbills and between April and July, thousands of Atlantic Puffins. Harbour porpoise, Dolphin, Minke Whales and Basking Shark are also regularly sighted. You will then have approx. 1.5 hrs ashore allowing time to explore and stretch your legs or visit Café Canna Tea Room for lunch. We then set off for Rum where we pause at the white sandy beaches of Kilmory bay where Red Deer can often be seen. You will be landed ashore at Loch Scresort and then have approximately 2 hours to explore this beautiful island. 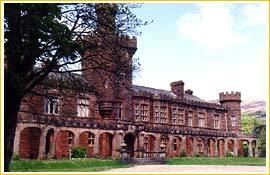 Take the short walk to the extravagant sandstone mansion - Kinloch Castle - where guided tours are available (1 hr approx). Alternatively, choose from a variety of nature and heritage trails around Kinloch or just relax by the shore. Then return to the boat before setting off on the final leg of our tour back to Elgol. For anyone travelling to or from any of the Small Isles or around the southern or western part of Skye, or Mallaig for example - climbers, walkers, photographers or anyone wanting a convenient and quick transfer or special trip. Also climbers starting a ridge traverse from Garsbheinn or for a really early start at Loch Coruisk please enquire using the link below. Surprise friends or family with a day or half day tailor-made excursion. Organise a works outing or treat important clients. For Commercial work, AquaXplore is licensed to carry up to 900 kg of cargo.